We’ve finally had the opportunity to decompress after an eventful PMRG ANC 2014, and there was a lot we garnered from the trip. We sent three different members from the Observation Baltimore team, so each of us had our own highlights from the days we were there. Mira Davis-Kelly, Karen Hernandez, and Peter Scanlon have all included their takeaways from the conference. 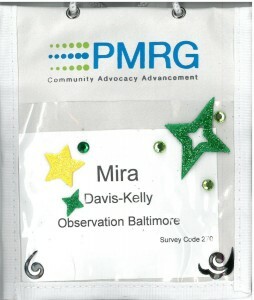 Mira: Another great year at PMRG! There was a great lineup of content to fuel our curious minds. I enjoyed hearing Daniel Pink share his insights on how we are now all in sales, and it could not be truer. This does not mean our old view of ‘used car salesman’ sales, but rather the exchange of services, goods, advice, and even support from one person to another – internally or externally to an organization. Douglas Goldstein’s keynote was also great. It was fascinating to learn about different technologies already in the works and the effect they will have on the future of healthcare. And this is just the tip of the iceberg! Even more intriguing is imagining what comes after this. Are we all going to be in body armor that can read our health status and cure us automatically? That would be something, wouldn’t it? Congratulations again to our Coach bag winner, Lynn Welsh, from Olson Research. 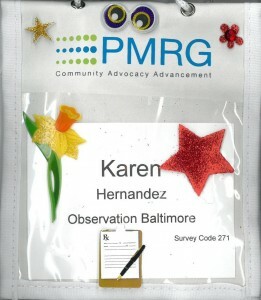 I’d also like to extend a huge thank you to the hard-working organizers that make PMRG possible each year. Karen: I find it so enjoyable to meet new faces along with old friends in one locale. Conversations with others that provide insight into client needs and different methodologies are so helpful in designing the offerings here at Observation Baltimore. I thoroughly enjoyed Leading by Leveraging Real Perceptions of the Competitive Landscapewith Colleen Cassidy and Mallika Ambat. The idea of creating more of a debate-like atmosphere for physician studies is thought provoking. Colleen and Mallika said they found this has produced a deeper level of discussion among the members in the focus group. Incorporating a fresh technique allows the participants to become more involved and step outside of their comfort zone. 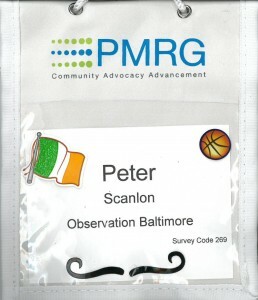 Peter: This was my first conference, so my point of view is more about the experience. I spent most of my time in our booth and learned a lot from those that stopped by it. I enjoyed learning more about the various people that makeup the pharmaceutical research landscape. We work predominantly in qualitative research, but I got to see some of the people who work in quantitative and how both sides come together to give the end client the best collective insights possible. My favorite takeaway from the breakout sessions was in Realizing Your Role as a Strategic Leader with Scott Snyder of Mobiquity and Betty Adamou of Research through Gaming. They presented ideas of how to make change within your organization. One interesting concept they discussed was MVP, or minimum viable product. When trying to create something new, try producing the maximum amount of results with the minimum amount of effort. This helps the company make informed decisions while still minimizing the resources spent in the event the product or idea does not perform well. This entry was posted on Wednesday, March 19th, 2014 at 5:45 pm. Both comments and pings are currently closed.